The Hoxton Hotel is the perfect balance of budget and design, which is why it's one of our favorite London hotels. The rooms are all decorated the same, and outfitted with the same great details, so you don't have to worry about which room you book. Unless of course you go for one of the Hoxton's 8 concept rooms, which are a bit more flamboyant in their styling. 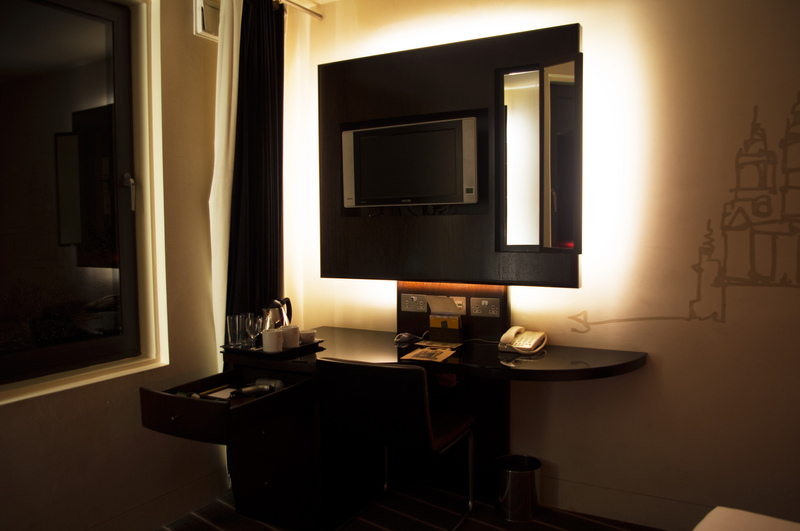 The regular rooms are modern and stylish in dark tones with a hint of sass. You'll notice playful wall murals, and fun throw pillows on their comfy beds. The sleek bathroom with plush towels and a lovely rainwater shower is the prefect place to unwind after a long flight. There are a few other perks at The Hoxton that make it a joy to stay here. Free WiFi for one, a corkscrew in every room (yeah, it's like they saw us coming), and a fantastic FREE breakfast hanging on your door every morning. The breakfast is great, every night you'll find an empty brown paper bag in your room that you simply check off to tell the staff what time you'd like your breakfast (6am, 7am, 8am, or 9am). You then hang the bag outside your door and in the morning you wake up to a filled paper bag with yogurt, granola, OJ and a banana. No knock to wake you up, no worrying about room service tips, you just open your door and it's there. No, it's not a hot breakfast, but it is enough to tide you over until you get to your next meal. There's also a kettle with tea and coffee in-room (hint: milks in the mini-fridge! ), so you can pretty much treat your morning as you would at home. This sounds like a small thing, and it is, but for someone who travels frequently it's nice to be able to have a coffee and a bite to eat before you venture out for a long day. If you're not great at packing and forgot something important, head to the front desk where you can nab essentials like toothbrushes and toothpaste and reasonable prices. The bar inside the Hoxton Hotel (the Hoxton Grill) is usually packed by 9pm with 30-somethings sipping on fancy cocktails getting ready for a night on the town. Which brings us to the best part thing about staying at the Hoxton Hotel—getting exposure to Shoreditch, one of the London's more exciting neighborhoods. Shoreditch has fantastic shopping, a serious art scene, and a ton of clubs and bars to party at. The neighborhood is also just gritty enough to make it interesting, and since it's not your typical tourist destination you'll get the opportunity to mingle with real Londoners. You'll find killer streetart all over the Shoredtich, and the famous Bricklane is just a 15 minute walk away. If you peek inside the desk drawer in your room you'll find a handy map of Shoreditch with a few key places to check out. Rates at the Hoxton Hotel are average for a budget hotel in London, but if you happen to catch it during one of its legendary £1 sales, you can get your room for a song. If you head over to their website you can be put on the mailing list to get a notifications of the sales. You'll have to act fast when you get that notification though, these rooms go quick. For those flying into London on a set itinerary it can be tough to coordinate the £1 sale with your confirmed itinerary, but it never hurts to try. The Hoxton Hotel is scheduled to open a second location—The Hoxton Holburn, in May 2014. This second location will likely have a ton of promo codes and £1 sales to advertise the opening so keep your ear to the ground for that one if you're planning a trip to London in May.